Marshall JMP50 Model 1987 "Plexi"
A modern approach to understanding tube amp design. Learn more. Pentodes and beam power tetrodes are the amp-builder's choice for power amps, so why don't we see more of these multi-grids populating the preamp sockets at Austin City Limits? Historically there have been exceptions. Manufacturers like Kay, Maestro, and Silvertone come to mind. But these consumer names are rarely seen on the sound stages of today. Pentodes have occasionally warmed classic preamps from Gibson and Vox, but these are the exceptions. Twin-triode voltage boosting continues to dominate the front ends of the amp-building industry. Maybe it's time to think outside the classic Fender-Marshall cabinet, at least briefly. Consider it a mind-expanding diversion from traditional market expectations! Technical explanations for what some might call 12AX7 snobbery include gain-per-socket, system noise floor, even microphonics, the tales of which usually far exceed reality. We certainly can't overlook the legacy of the 5F6-A dual-triode front end and all the great music it has created over the years. I suspect, however, that the lack of enthusiasm for pentode preamps among professional builders is caused, as least to some extent, by a smidgen of electrode intimidation. The presence of a screen grid injects greater complexity into a design process that already contains a multitude of decision points. The truth, however, is that the screen creates greater flexibility to achieve desired results. With this tutorial I hope to alleviate multi-grid anxiety and demonstrate the creative possibilities that pentodes can offer to preamp design. There are numerous ways to design a pentode voltage amplifier, so the procedure I describe here represents only one of many possible approaches. It also would be misleading for me to suggest that I follow these steps rigorously every time I sit down to create a circuit. Just writing all this down seems to sacrifice art for, well, bookkeeping. Sometimes, I'll readily admit, I solder first and measure later. These caveats notwithstanding, let's create an EF86 preamp! The number of components in a pentode preamp is greater than in a triode preamp, but don't be intimidated - there is much more similarity than difference. The grid circuit, in this case a gamma network formed by RG and RGS, has the same possibilities as for triodes. The only real difference is that the grid-stopper RGS tends to be larger because the Miller capacitance of the tube is substantially lower. In fact, this characteristic was the feature that spurred the invention of tetrodes and pentodes in the first place: less radio-frequency attenuation due to inter-electrode capacitance. We'll determine appropriate values for these resistors later in this tutorial. The cathode circuit formed by RK and CK is also familiar to conventional triode preamp designers. The cathode resistor sets the DC grid bias and the bypass capacitor reduces the negative feedback from cathode degeneration, just like for a triode. Moreover, determining cathode impedance is actually a bit easier than for a triode. We'll crunch the numbers later. The only topological differences are in the plate circuit. 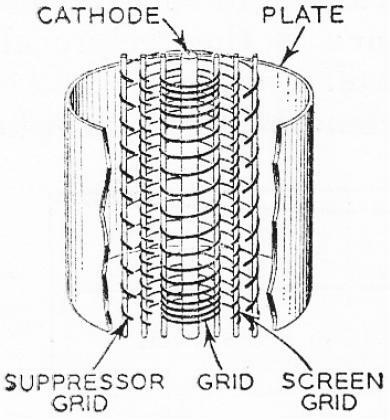 The triode's main working element, the plate, is split into a separate plate and screen. The former becomes an exploited servant. The latter, an omnipotent overlord. In a triode there's one guy digging a ditch at his own pace. In a pentode there's a supervisor telling him how fast to dig and when to take a lunch break. The plate still does all the work. It still takes the lion's share of electrons emitted by the cathode, but now the screen controls how many electrons it must endure. So the key to designing a pentode preamp is to consider screen voltage to be the controlling element and plate current to be a helpless victim driving the next stage. Why else would a perfectly rational designer use graphs for plate voltages that are more than 100 volts different from reality but say that it's OK? Later in this tutorial we'll have the opportunity to ignore the truth just as egregiously. Let's assume we began our amp design at the speaker, worked our way back through the power amp and phase splitter (the output-to-input approach usually taken) and have determined that an upstream voltage V2 of 325 volts meets our design goals for downstream headroom and power supply filtering. Let's also assume that the next stage needs a signal amplitude of 1 volt to drive the power amp to full power. This means the pentode preamp needs a gain of 100 to achieve an input sensitivity of 10 millivolts, which is plenty of overdrive potential even for the most wimpy of pickups. Voltage boost by a factor of 100 is just beyond the reach of a 12AX7 triode, but well within the capabilities of an EF86 in pentode mode, as we will see. Let's also assume the preamp drives a 1M volume control, which is a relatively light load, even for a pentode. There are a lot of unknown voltages, currents, and parts values surrounding our pentode, so it's convenient to determine at least one parameter early in the design process, thereby concentrating most of our brain cells on what is truly important. The unknown I like to pick off first is the plate and screen supply voltage V3. This solves what seems to be an endless chain of dependencies: V3 depends on the current through R3, which depends on the DC operating point of the pentode, which depends on the supply voltage V3. Solution: just pick a reasonable value and stick to the decision. V3 needs to be significantly lower than V2. Otherwise R3 is pretty small, requiring a large value for C3 to ensure adequate ripple filtering and decoupling proportional to the product R3C3. A 75-volt drop across R3 to 250 should provide plenty of RC filtering without an outrageous capacitor value. The downside to a large voltage drop is reduced headroom, but this is the amp's first stage, where signals are at their smallest. That was easy! Next we tackle DC conditions. 1Richard Kuehnel, Vacuum-Tube Circuit Design: Guitar Amplifier Preamps, 2nd Ed., (Seattle: Pentode Press, 2009). Guitar Amplifier Electronics: Basic Theory - a modern approach to understanding tube amp design. Learn more. Guitar Amplifier Preamps - upstream circuits using triodes and pentodes. Learn more. Guitar Amplifier Power Amps - from the phase inverter to the loudspeaker. Learn more. The Fender Bassman 5F6-A - plus Marshall's Bluesbreaker and Plexi. Learn more. Georg Simon Ohm - Imagine a world without Ohm's Law. Learn more.